My decision to become a celebrant was born from the innate passion that I have for seeing people unite through truth and love. Providing services for people that enable them to embody the richness of what is important to them and bring that into fruition is important to me. 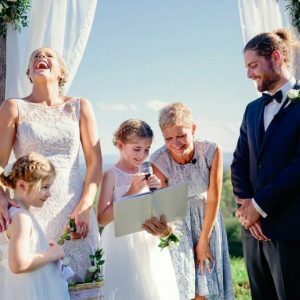 I am very passionate about my role as a celebrant and I consider it an absolute honour to be a part of this significant ceremony that you are sharing with each other, your family, friends and loved ones. The ceremony is designed to express the truth of what is real for you and embody that into your ceremony, so together we draw on what is most meaningful to you and to bring this into this ritual. My background is in the personal and professional development arena. I was a consultant for over 15 years, facilitating couples, families and people in general to come together and restore the love and understanding that was missing in their lives and relationships, it made becoming a celebrant a very natural and joyful choice for me. I am based in Brisbane, although I regularly conduct ceremonies in Northern NSW, Sunshine Coast and West of Brisbane. I am happy to travel to wherever your chosen location is. From my experience, when our hearts are open to the authenticity of what is present in the love for each other, what arises naturally is a depth, warmth and realness that saturates the moment in a beautiful truth that touches everyone present. I look forward to walking alongside you to create this experience together.